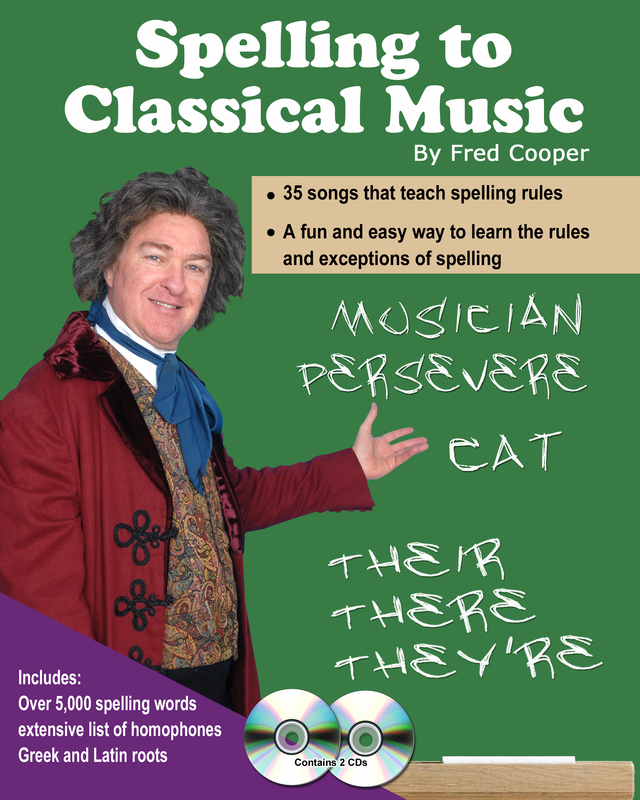 We proudly introduce our newest product in the Sing 'n Learn family, Spelling to Classical Music, 35 songs that teach the rules of phonics and spelling plus a great instructional book with over 5,000 spelling words organized in a way that makes sense. Music can be used to teach any subject more effectively, even SPELLING! Remember the days when you were a kid in school and had to get ready for those weekly spelling tests every Friday afternoon. So often, I merely repeated those words over and over again and learned them by rote repetition. So often, there were lists of words and no real system for learning them. Well, now you have a system. Spelling to Classical Music categorizes over 5,000 spelling words according their phonics sounds and teaches the various options for spelling words with each of those sounds. There's a song for each phonics sound. And, they're not just any old kid's songs. They're written to classical music melodies that you know and that you will want your children to know. Spelling to Classical Music harnesses the power of the greatest music ever written to teach phonics and spelling in a way that makes it interesting and fun. Using familiar classical melodies like the ones you hear in movies, your students will learn the sounds that letters make and the options for using them to spell the words we use every day. In learning about homophones, they will see how words that sound exactly alike can be spelled in different ways. English spelling can be complicated! They will learn the rules and the exceptions. And, as they learn the spellings, they can explore the meanings of those words and expand their vocabularies to speak, read and write the English language with great success. The kit includes a 160-page book and two CDs with songs sung to the music of Bach, Handel, Beethoven, Mozart, Tchaikovsky, John Phillip Sousa, Sir Arthur Sullivan, Verdi, Grieg, and even a few composers you may not know so well. But, you do know their wonderful music. These are the classic greats that people have loved for centuries.